These two bakery rooms were attached to a large mudbrick building enclosed by a wall 1.5 meters thick. Just prior to our Spring 1991 season, a back hoe had made two large holes in this place, just missing the bakeries, but destroying much of the southeast corner of the large mudbrick building. 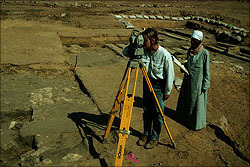 In 1995 we excavated three 5 x 5 meter squares (E18, F19, G20 in fig. 1) to find out more about this building and the kinds of activities that the Fourth Dynasty Egyptians carried on inside the mudbrick wall. We found curious low benches separated by narrow troughs or channels and paved with marl (tafla ) clay. Embedded in the floor alongside these benches, we found very fragile remains of fish bone. 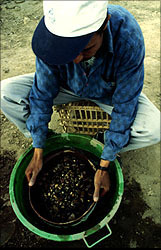 The evidence we found in 1991 and 1995 indicated we were excavating a food-production center, perhaps the institution called per shena ('commissariat'?) in hieroglyphics texts and tomb scenes. A review of ancient Egyptian food preparation at other sites and other periods indicates that such production was attached to households - large houses of prominent people, palaces, or temples, as "houses of the gods." 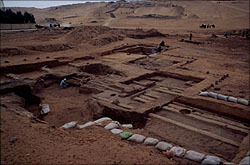 Middle and New Kingdom granaries, bakeries, breweries, carpenter and weaving shops were attached in modular fashion to large households, as, for example, in the town connected to the 12th dynasty pyramid of Senwosret II at Illahun, or within urban estates at the 18th Dynasty site of Tell el-Amarna. Our bakeries and fish processing area are inside, or attached to the exterior, of an open-air enclosure, defined, at least in the southeast corner, by the large mudbrick wall. Similarly, production facilities in large households and urban estates known from other sites and periods are often located in an enclosure around the core residence. 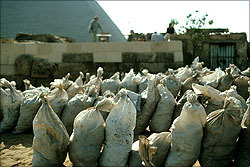 As with almost all archaeological projects in Egypt, we now sorely need a study season—in which we do nothing but sort and analyze material and refrain from further digging until we catch up. 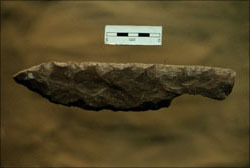 Much of the story our site has to offer is revealed in the analysis of this material. Richard Redding's work is an example. 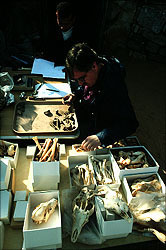 During his weeks with the project he analyzed much of the bone from previous seasons. The following are only his preliminary impressions, before he prepares a more detailed report based on his meticulous studies. Of the fish remains, the Nile catfish (Clarias) and schal (Synodontis) are the most common. Richard found that those tiny bits of bone that we recovered from the floor of the 'benches and troughs' area included some from mammal as well as fish. Also, we found fish bone from a number of different places in our excavations, not only alongside the benches. So we cannot be certain that the benches and troughs were exclusively for cleaning fish—although the term "fish processing area" has almost been as ingrained in our site vocabulary as the term "bakeries," which we know to exist. As for mammals, Richard's analysis shows a significant number of young male cattle, under two years of age, probably brought to Giza on hoof and slaughtered for meat nearby (remember, no refrigerated delivery trucks in ancient Egypt!). Cattle in general are considered a costly source of meat. They are fussier about their food and need to drink more than sheep and goats which have wider grazing habits. Cattle are certainly more costly than pigs, which are omnivorous and reproduce quickly. 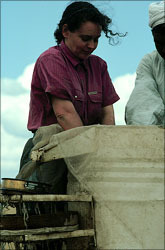 Pigs, which cannot move long distances, are associated more with a provincial village way of life. So, to be simplistic, we are seeing evidence of expensive grain and expensive meat. If these impressions hold up to closer scrutiny, this material reflects a higher status of consumers than in village sites in provincial Egypt. That is, we may be digging the discarded remains - the garbage - of an expensive way of life, the economy of what some archaeologists would call the Egyptian elite. These patterns perhaps bode well for the 'palace hypothesis' - the idea that we are excavating the back part of an outer enclosure around a royal residence of the pyramid building kings. 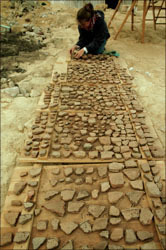 You may have read elsewhere on this Web site of the huge numbers of bread mold sherds from our processing of A7/16 (see 'Mysteries of the Bread Pot'). Again this season we often had to dig through enormous dumps of pottery, bone, and other ancient trash to delineate the architecture in its various phases. We found such a dump covering the main wall of our interest in square D17 (see below). Just about everywhere on the site, often mixed with the stone and mudbrick debris that may have been purposefully used to level this building complex after it was abandoned, we find quantities of dumped material that must indicate a high volume of consumption. Could just the royal family and retainers have consumed so much bread and other stuff in a generation or two? Or are we thinking in the wrong terms to expect, in this early period, an "elite" completely separated from a "workforce"? What clues would we find in the architecture?